A popular Indiegogo venture to build a secondary e-ink display for the iPhone has shut down after raising over $1m – and donors will not get their money back. Yashar Behzadi and Greg Moon, the founders of Popslate, the eponymous company behind the popSLATE 2 secondary smart screen, explained that the company will be dissolved, no devices will be shipped, and no refunds will be issued. Oh, and no further explanation will be offered. Popslate intended to produce a phone similar to the 2014 Yotaphone 2*, the first to marry a colour high-resolution main display to a secondary e-ink display. 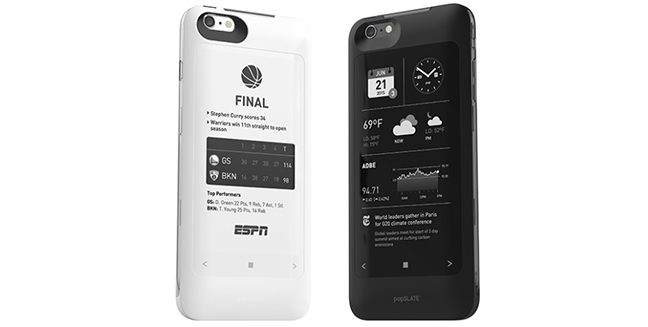 Initially popSLATE developed a clunky e-ink case for the iPhone, which the company claimed was the "first plastic ePaper display", and this led to the Popslate 2. Shipments were due six months ago, but in the founders' final post they explained that Popslate 2 had run into "critical" technical issues requiring a redesign. "Our housing material is not compatible with Apple OTA requirements. You may think, 'Wait, isn't it just plastic? Why would that be a problem?' While the housing is indeed largely plastic, we used a very special custom blend of materials that included glass fibers," the founders explained. "Unfortunately, we have concluded that these added fibers are attenuating the RF signal and that we would have to spend additional cycles to tune a new blend with required modifications to the tooling. This is an expensive and timely process." Popslate is one of the more spectacular crowdsourcing failures. As readers like to stress, donating to a crowdsourced project offers neither the legal protection enjoyed consumers, nor the equity reward for investors. It's simply a blind pledge of faith. Unlike Kickstarter, Indiegogo does not require a demonstrable working prototype. *Yotaphone surfaced recently on Instagram to say it's readying a third-generation device.